Posted on Mon, Nov 14, 2011 : 11:54 p.m. Freshman Trey Burke (3) made his first start for Michigan on Monday, scoring 13 points in a win over Towson. The first official moment of Trey Burke's Michigan basketball career wasn't exactly sparkling. His encore, though, was worth the price of admission. After being benched due to practice tardiness prior to Michigan's season opener against Ferris State on Friday, Burke responded with 13 points, two rebounds and two assists in a game-high 30 minutes Monday in a 64-47 win over Towson. "It was a lesson learned," Burke said of his hiccup. "There's no excuses, it won't happen again." It didn't take Burke long to prove why he'd earned a spot in the starting lineup to begin with. On Michigan's first trip down the floor, Burke quickly found sophomore Tim Hardaway Jr. in the lane for an open jumper, notching his first career assist in the process. With that milestone out of the way, the 5-foot-11 freshman focused on the other part of his game: scoring. Burke went on to nail back-to-back 3-pointers less than a minute apart, giving Michigan a quick 8-0 lead and spearheading the team's scorching 21-0 start. His tardiness last week proved he's still a freshman. But his performance Monday showed how he can play well beyond his years. "I just feel like I'm out there in a groove," Burke said. "I'm the point guard, and the team feeds off my poise. "It was my first collegiate start, I was kind of nervous the first couple minutes, but not a scared nervous." Michigan coach John Beilein said he was impressed with how under control Burke was throughout the night, and added that he spent roughly 25 minutes in his office prior to the game with the freshman floor leader, going over various film cuts. Beilein says he's thrown a lot at Burke over the early portion of his rookie season, but so far, he's handling things like a veteran. "He's really shown some very high aptitude to learn, and there's a lot coming at him," Beilein said. "I would compare it to a quarterback in football. "There's a lot coming at him and he's doing very well with it. It's all starting to slow down, but then people will play him different and the competition will get better. He'll have to continue to grow." 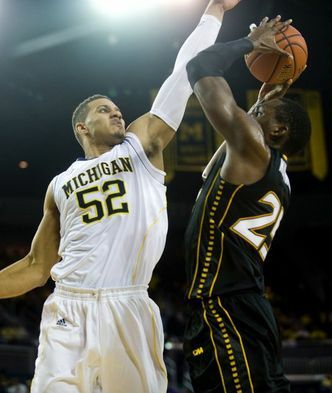 Michigan's Jordan Morgan, left, attempts to block a shot from Towson's Robert Nwankwo during a game at Crisler Arena on Monday evening. After sophomore forward Jon Horford earned the start at the five position against Wayne State in Michigan's exhibition game and then again Friday against Ferris State, Beilein opted to go with sophomore Jordan Morgan to start the game against Towson. Morgan, who started all 35 games a year ago, finished with six points and five rebounds in 19 minutes of action. Horford, meanwhile, went for four points and a team-high seven rebounds in 14 minutes off the bench. "We went two games looking at one look and we didn't like the starts we were getting," Beilein said. "And Jordan had an exceptional week in practice." Beilein added that the rotation hasn't been defined just yet, and he hasn't set a concrete rotation. Along with sophomore Evan Smotrycz, Michigan grabbed 16 total rebounds from its three big men Monday. Now, Beilein says, the task will be getting more scoring production from the bigs. "We've got to find ways to score more inside," Beilein said. "Between (Morgan and Horford) and Blake (McLimans) and Evan, we've got four guys we can play at that center position. "We've just got to find what's best for us in certain games." The Wolverines continued to struggle from the free throw line Monday, going 8-for-16 as a team. Through two games, Michigan is now 14-for-26 from the stripe, a 53.8 percent success rate. Not near good enough, according to Beilein. "It's something that happens, but we've got to keep working at it," Beilein said. "We've got good shooters. ... But we can't shoot 50 percent from the line like we are right now. "It's only two games in, but we've got to work at it." Beilein put Michigan into the 1-3-1 defensive set briefly late in the second half, allowing some of his younger players a chance to get their feet wet with the set. One player who got his first crack at Beilein's trademark defense was Burke, who was positioned at the back end of the set. "That's pretty tough," Burke said. "I've got a lot of responsibility back there, but with the help of Stu (things are easier). Stu's a great defender in man and zone and he teaches me how to cheat on the back end. "I've got to get from corner to corner sometimes if it's a skip pass, but with the help of Stu and the help of our coaches, I pretty much know how to do it." After dropping in 14 points, five rebounds and four assists against Ferris State, Douglass finished 0-for-7 from the floor and 0-for-5 from 3-point range. ... Freshman forward Sai Tummala was not dressed Monday due to concussion-like symptoms, according to Beilein. ... Freshman guard Carlton Brundidge played the game's final six minutes, totaling one point on a free throw. Classmate Max Beilfeldt was the only dressed Wolverine not to play, and he has yet to record a minute this season. ... Through two games, Michigan has shot 15-for-53 from 3-point range, a 28-percent clip.